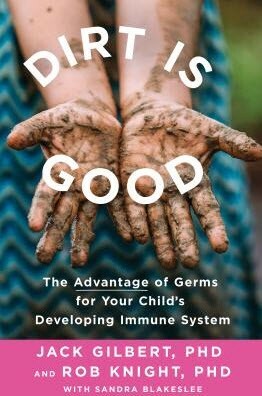 There is a downside to over-sanitizing a child’s environment that may impact life-long health according to the book “Dirt Is Good: The Advantage of Germs for Your Child’s Developing Immune System,” by co-authors Jack Gilbert, Ph. D. and Rob Knight, Ph.D. with Sandra Blakeslee, published in June, 2017. The book is a useful guide for parents, pregnant women, child care providers, health care workers and informed consumers. It addresses topics such as antibiotics, probiotics, prebiotics, diet, breast-feeding, medications, soaps, hand sanitizers, exposure to pets and animals, sterilization of pacifiers, vaccines, bathing, hygiene, ear infections, diseases, medical conditions and more from a human microbiome point of view. According to “Dirt Is Good,” there are approximately 1.3 microbes per every human cell; the average human male has 30 trillion human cells and 40 trillion bacterial cells. The human microbiome is the collective genetic material (DNA or RNA), also known as the genome, of the microorganisms (excluding micro-animals), that reside on or within the tissue, organs and fluids of the human body. These microorganisms include prokaryotes (bacteria, archaea), eukaryotes (fungi, protists), and viruses. Gilbert, Knight, and Blakeslee explain that parents can alter the microbiome and that the first three years of a child’s life are the most impactful on developing a healthy immune system. The probiotic industry is described in “Dirt Is Good” as “a billion-dollar industry with virtually no medical oversight” with “no credible evidence that the regular consumption of a probiotic yogurt (whether dairy or non-dairy) will make your child or you any healthier.” However, the authors do cite various research studies that show probiotics help to reduce ear infections, decrease the symptoms and duration of diarrhea, improve responses to vaccines by stimulating the immune system, and even reverse peanut allergies in children. The authors maintain that there is growing evidence that bacteria found in probiotics may help the body eliminate bisphenol A (BPA), a potentially harmful endocrine disruptor that mimics estrogen, found in many consumer products. In a research study, rats who consumed Bifidobacterium breve and Lactobacillus casei (two friendly bacteria strains in yogurt), had greater amounts of BPA in the feces than in the blood and urine. Whether this also applies to humans requires further research. 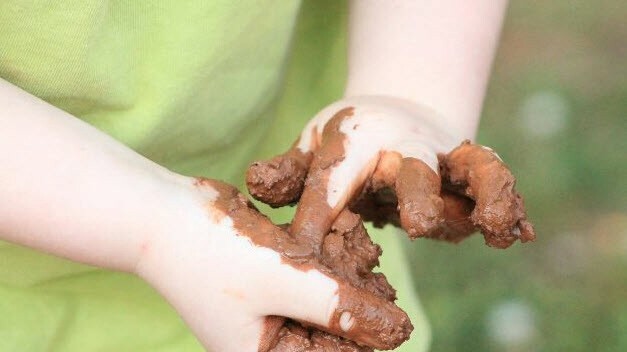 According to “Dirt Is Good,” exposing children to dirt and animals can help develop a healthy immune systems and that the benefits of antibacterial or antiseptic wipes are “generally overblown.” A wide range of consumer products such as hand sanitizers, disposable diapers, wipes, and soaps has made cleanliness and germ-fighting convenient. The authors of “Dirt Is Good” suggest hand washing versus the use of alcohol wipes because it could make it easier for populations of bad bacteria to thrive if the child’s hands are dried out. The authors advocate washing with plain soap and water before eating and if toddlers have touched anything that may have pathogens. They maintain that hand sanitizers and antibacterial soaps are useful in scenarios when a person is exposed to pathogens such as touching surfaces that were in contact with raw meat or in a health-care setting, but not needed for everyday life. The book debunks the five-second rule folklore that food that has dropped on the floor is safe to eat if picked up within five seconds or less. According to the authors, an object will pick up bacteria if dropped on the surface upon contact. “Dirt Is Good” shows that not all germs are harmful and that exposure to beneficial ones can help a child’s developing immune system. When it comes to raising healthy children, there is such a thing as being too clean. Copyright © 2017 Cami Rosso All rights reserved.